The former estate village of Sudbury is situated situated in the lower Dove Valley, 11 miles (18 km) to the south of the Peak District town of Ashbourne. An ancient village, Sudbury was mentioned in the Domesday Book of 1089 when it belonged to Henry de Ferrers, a Norman knight who is believed to have fought at the Battle of Hastings and was consequently granted vast estates, mainly in Derbyshire and Leicestershire, by William the Conqueror. Sudbury became the property of the influential Vernon family in the early sixteenth century, when Ellen Montgomery, heiress of Sir John Montgomery (d 1513) of Marchington and Sudbury, married Sir John Vernon (d.1545), High Sheriff of Derbyshire and Nottinghamshire, a younger son of Henry Vernon of Haddon Hall. 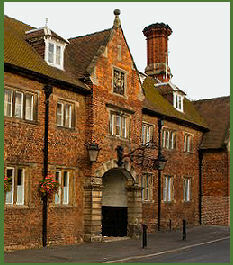 The Vernon Arms, (pictured left) is an old coaching inn and dates back to 1671, it proudly displays the Vernon Crest above the entrance. The inn serves excellent food. The village church of All Saints was recorded in the Domesday Book but has been extensively restored and altered. There remains evidence of the original Norman work, the attractive balustrade parapet was added in the seventeenth century. The magnificent east window, the work of a German artist, was donated by Queen Victoria and Prince Albert in memory of George Edward Anson, private secretary to the Prince and brother of the then rector of the church. The oldest monuments are the thirteenth century recumbent effigies of two ladies, who are believed to have been members of the Montgomery family. The Vernon chapel contains some fine monuments including an alabaster tomb chest to John Vernon (d 1600) and his wife Mary. 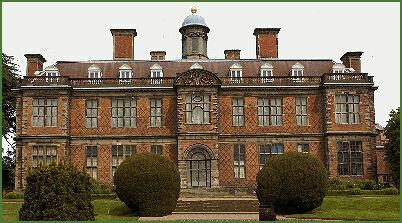 Imposing Sudbury Hall, with its unusual diapered brickwork, is one England's finest Restoration mansions. The hall was built by George Vernon in the second half of the seventeenth century, who employed the finest craftsmen and artists of the period to work on the building. Although built in the reign of Charles II, the house was Jacobean in conception, built of red brick to an E-Plan, with two projecting wings and a central porch. Sudbury Hall contains a magnificent Great Staircase, which was featured in the BBC's 'Pride and Predudice'. The handsome Long Gallery, which runs the entire length of the house, boasts what is possibly the most impressive ceiling of any house in England. The room contains portraits by John Michael Wright and of Charles II's mistresses, including the notorious Barbara Villiers, Countess of Castlemaine. The hall has exquisite plasterwork and wood carvings by Grinling Gibbons, including a splendid overmantel, and elaborate painted ceilings by Louis Laguerre. Sudbury Hall was used for the internal Pemberley House scenes in the BBC dramatisation (1995) of Jane Austen's Pride and Prejudice. One of the many interesting features of the building is the the small dome, crowned with a golden ball, which acts as a beacon for travellers. The property was leased for three years from 1840 by Queen Adelaide, the widow of King William IV. Sudbury was given to the Treasury in 1967 in part-payment of duties on the death of the 9th Lord Vernon. It was subsequently transferred to the National Trust. On the death of John Lawrance Vernon, the 10th Lord Vernon, the title was inherited by Anthony Vernon-Harcourt. the barony remains extant. The Museum of Childhood is housed in The Victorian service wing and contains many old toys and games. During school holidays the National Trust holds regular activities for children including treasure hunts, craft days and wildlife days. Sudbury's original formal gardens were removed in the eighteenth century and the grounds were landscaped in the naturalistic style made fashionable by Capability Brown.The Park covers a large area and has a lake. The National Trust have added various new features which include lime trees standing in front of the nineteeth century Wing. The Coach House Restaurant serves a seasonal menu, using local and fair-trade products wherever possible. There is also an adventure play area for children in the woods.